NOTE: The FW adapter is not intended to be re-used, the freewheel and FW adapter are replaced as a single piece. Not every frame is the same, not every install is identical. Tangent uses a 150mm wide ISIS spindle for compatibility and adjustability. The motor chainline is designed to use 24mm of spindle stickout with the Tangent freewheel crankset. Support the fixed side bearings in a bench vice- ideally the inner race of the bearings are supports by the vice jaws (be sure not to squeeze the spindle, we want it to move). Gently tap the spindle a few mm's through the bearings. This will have the effect of moving the crank/spider closer to the frame. Support the fixed bearing cup as shown above. Gently tap the spindle through the bearings. NOTE THE INSIDE SHOULDER preventing the bearings from sliding to give more than 28mm of stickout. The BB cups need to be set correctly for your frame width by adjusting the left side bearing position until the distance between the inside faces of the bearing cups matches your frame width. Some versions of the BB utilize a separate threaded piece for the shoulder of the left side bearing cup. The left side bearings should be positioned such that the threaded flange can be tightened down onto the Tangent mounting plate when the cup is at an appropriate distance for your frame (the cup should be supported almost fully by the bearings). Stickout is measured from the end of the spindle to the outside face of the fixed bearing cup. The Tangent reduction gearbox is designed with a special gear tooth profile that retains significant amounts of grease in the dedendums (valleys). This lubricant is pumped throughout the gearbox under the motion of the eccentric gears. Our gearboxes are slightly overfilled during assembly, you may experience some seepage past the o-ring seal behind the freewheel. This is expected, wipe away any grease before it contacts the chain (attracts dirt). The initial greasing interval should occur between 200-400 miles, and every 500-750 miles thereafter. The procedure requires only a few minutes and entails removing the gearset, wiping away the old grease and re-applying 20mL of fresh Vigogrease RE0. Step 1: Use a flat blade screwdriver to pry the notched end of the snapring loose, carefully walk the ring out of the groove. Step 2: Remove the M6 freewheel hold-down screw in the center of the FW. Clean any debris or dry locktite from the area and threads. Screw the M6x60mm extraction bolt into the center of the FW (the bolt passes through the FW piece and threads into the output of the gearbox). BE VERY CAREFUL WITH THESE THREADS. Screw the long M6 into the unit until contact is made with the motor shaft (picture above shows contact point). Gently thread the screw into the gearbox, it will pull the gearset assembly free from the housing. Step 3: Wipe clean the eccentric assembly and inside the housing. Clean the dirty grease from inside the valleys of the ring gear and between the eccentric gears. The goal is not spotless, but a majority of the old grease has been cleaned out. Step 4: If your gear assembly pulled apart during removal, carefully re-assemble. NOTE: The eccentric gears require alignment before insertion into the housing (see picture). Both gears are identical, both have a one-dot and a two-dot aperture hole marked. The same output pin needs to pass through oppositely marked holes on either gear-- the gears are aligned 180degrees opposite each other. The same output pin will pass through the one-dot hole in gear A and the two-dot hole in gear B. The output pins are evenly spaced every other aperture hole (total 8 pins). 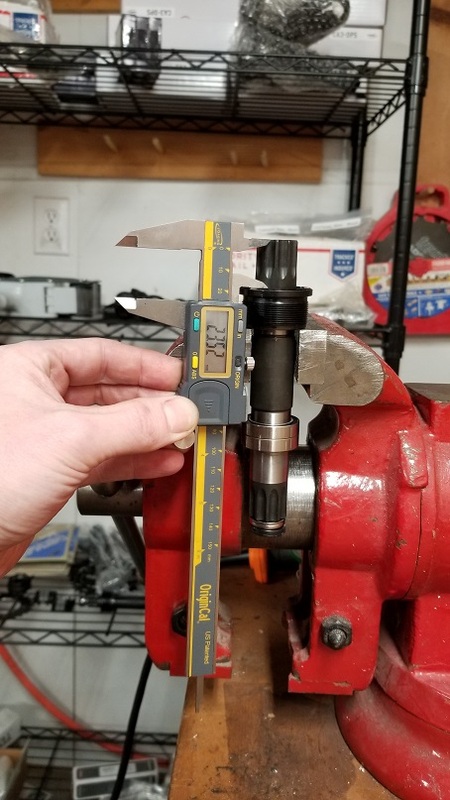 It is important to fully seat the camshaft into the carrier pieces and fully seat the output pins into both carriers-- the proper distance between outer faces of the carrier pieces is 42.25-42.75mm. Ensure the center camshaft spins easily and smoothly. Pro-tip: Place all 8 pins in either carrier piece, align the eccentric gears properly and slide the gears over the pins and ensure the center bearing is fully seated into the carrier. Align the opposite carrier with the output pins and carefully squeeze the two carriers together. Be very careful to squeeze the carriers together flat to prevent any binding of the bearings in their bores. Step 5: Apply the full 20mL of Vigogrease from the dispenser to the space between the eccentric gears. Align the motor key with the camshaft and carefully insert the gearset into the housing. Wiggle and twist the output piece while inserting the gearset. When the snapring groove is exposed, walk the snapring into the groove with the gap facing towards the BB. Use a flat blade screwdriver to gently pry against the freewheel and ensure the snapring is fully seated in the groove-- visually verify the snapring is seated to the same depth around the full circle. Step 6: Apply blue locktite to the M6 freewheel hold-down bolt, tighten to 5ft-lbs. Re-install chain, go shred.